According to the inflation calculator, $3,000 in 1892 would be equivalent to $83,332 in today’s dollars. $8 a month commencing February 20, 1866 and $12 month March 19, 1886. 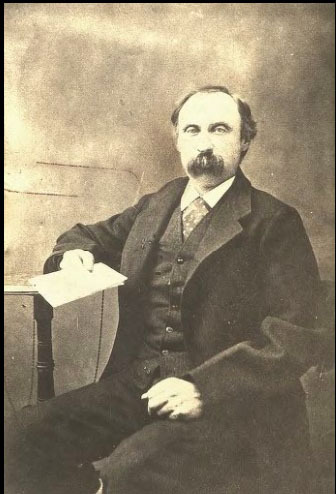 Thomas Giffe, recognized attorney receives a fee of $10. There is no information about how Katie Cleage’s life changed after receiving her pension. She does not appear in any more news stories. State of Tennessee County of Hamilton in the matter of claim for Widow’s Pension No. 288 -391 Katie Cleage claimant. On this Apr 6 1891. That her claim or widow’s pension, having been rejected for the following reasons: that the evidence fails to show that she is the lawful widow of the soldier, or was ever married to him. It has been shown that ever since the death of her husband that her sister-in-law and her brothers-in-law has been trying to supplant her and cheat her out of her just dues. And she believes that they have imposed upon the Hon. 2nd auditor by stating that the soldier had no wife and did they, perhaps, receive the pay, which was justly and rightly due to her. And she is willing and anxious to submit to the strictest scrutiny of this case. And therefore the Claimant appeals for a reconsideration of her Claim for the reason that gross injustice has been done to her in the rejection of this her claim. As it has been shown that she was a poor ignorant slave, young and childish, about 14 years of age when Mr. Cleage, her master insisted that she should marry Philip, another slave and while Mrs. Cleage was absent home, he – the master – read something, or at least had a book in his hand, and told them that they were married. And as her master is dead and her husband is dead and she has been unable to find any person who was present at the time except other slaves. She has proven that they were furnished by her mistress, Mrs. Cleage, with a cabin in which to live, that two children were born to them, that the soldier acknowledged her as his wife that they were recognized by officers and others to be husband and wife, that they were permitted to room together in camp when all women not having husbands in the Regiment were ejected and that she insisted on accompanying him to the pest camp to wait upon him and minister to him, but was denied that privilege and thus they were separated forever. And she had remained his widow these 25 long years, and when at last she asks for her lawful rights she is asked to prove her marriage, a thing which was never at that time recognized by the white people or slave owners, except that it served to keep them at home, by making them believe that they were married. 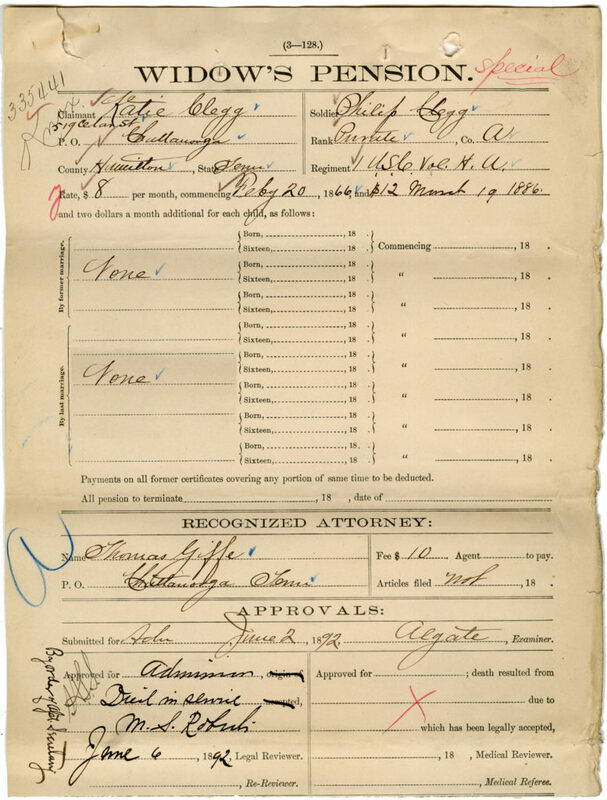 She hereby appoints, with full power of substitution and revocation, Thomas Giffe of Chattanooga as her true and lawful attorney to prosecute her claim. Her post office address is Cedar St. Chattanooga. I found the information used in this post in Katie Cleage’s Pension file. I have the honor to present to you herewith an appeal from the decision of the Honorable Commissioner of Pensions – together with the letter – notifying the widow of the rejection of her claim, which is the only notice which I have received. I am her attorney, as may be seen by a perusal of the file of papers of the case, and I cannot conceive how it happened that I have received no notice until the widow produced the letter dated Feb 25th last. It is evident that the Hon. Commissioner is mistaken in the merits of this case. A careful examination of the evidence will show that it is a straight forward claim, honest and just. And knowing this to be so I would not be doing justice to my client if I did not do this. Very respectfully your obt svt. I found the information used in Katie Cleage’s Pension file. 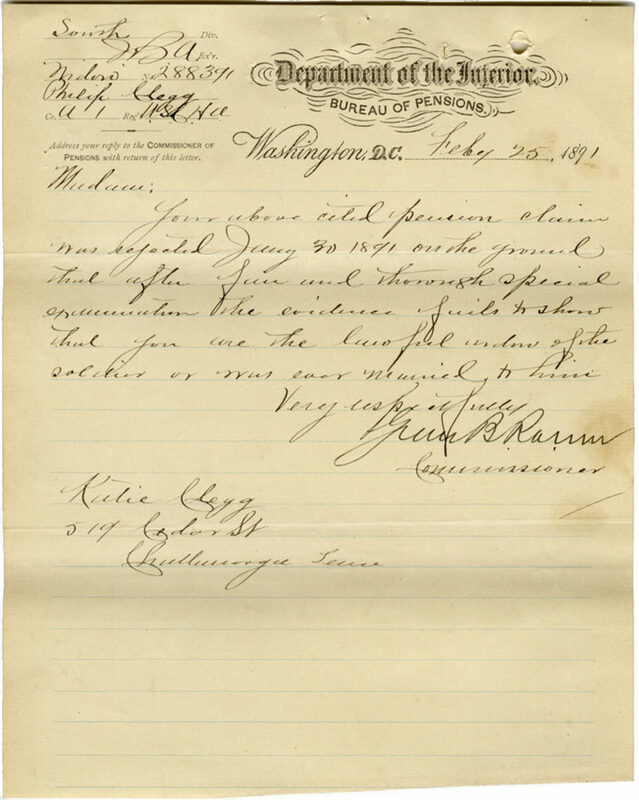 Your above cited pension claim was rejected January 30, 1891 on the grounds that after fair and thorough special examination the evidence fails to show that you are the lawful widow of the soldier or was ever married to him. Information used from Katie Cleage’s Widow’s Pension file. I have the honor to return, herewith, all the papers in case # 288.391, of Katie Cleage, widow of Philip Cleage, late of Co. A. 1st U.S.C. Vol., H. Arty’ and whose post office address is No. 519 Cedar St. Chattanooga, Tenn. The soldier died in the service Feby’ 19, 1865 and claim made by Katie Cleage is the result. Case was referred for special examination to determine whether the claimant was the legal wife of the soldier and whether she has again married since the death of soldier. In report of special examination dated March 28th 1889 the examiner recommended rejection and the case was submitted to the board of pensions for consideration. The case was subsequently referred for further special examination because the testimony obtained by the special examiner is more favorable to her case than otherwise. I believe I have exhausted all sources of information relating to this case and relating to reputation of claimant. I am obliged to disagree with former examiner. The claimant is an industrious, steady, hard working woman. She is not bright intellectually and is quiet deaf, which makes it difficult to obtain information from her. The fact that she has not been strictly virtuous at all times does not affect her reputation for truthfulness and I am unable to find any one who questions her integrity. The testimony is confused and contradictory and in some instances where shown to be inaccurate, the persons testifying were honestly mistaken, notably, James F. Bradford relating to death of Nelson McCaury. Bradford does not know claimant and was misinformed about claim and stated his views honestly and conscientiously. 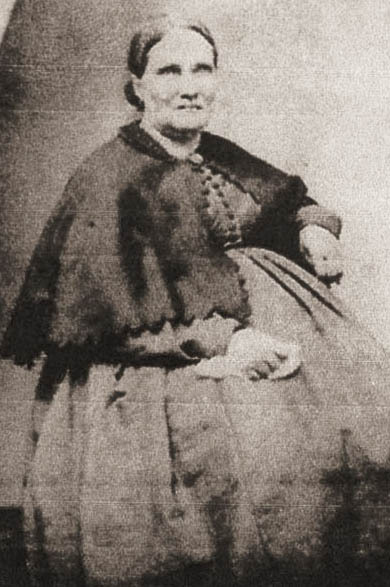 Lucy McCaury is an old colored woman, honest and conscientious, but is clearly mistaken in her testimony relating to claimants marriage, though on my second visit to her, she persisted in that statement. 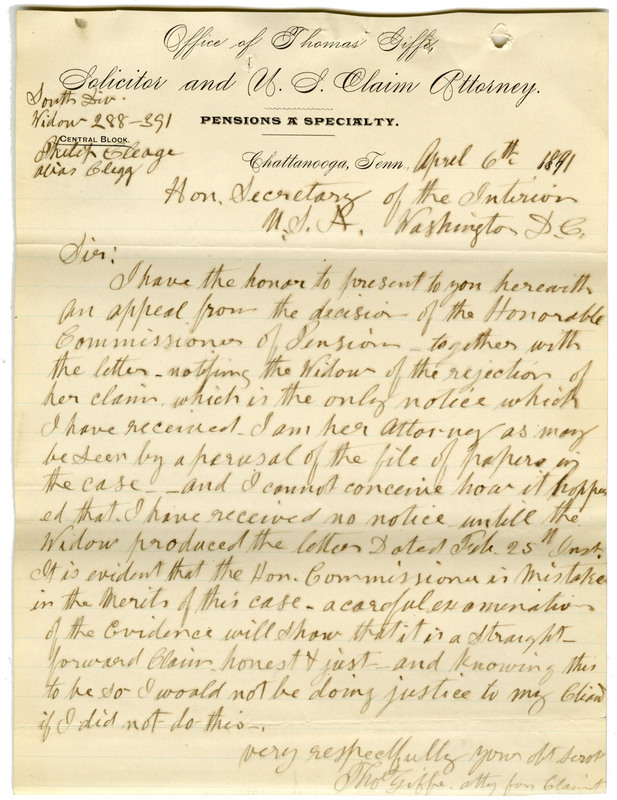 Charles A. Cleage, Thomas Bradford, Sallie Cleage Marsh, all bear good reputations, but were clearly prejudiced and their testimony together with that of Patsy Cleage and Adeline Shurman is contradicted in many particulars by Jemima Cleage (claimant’s former owner) and by Dr. Atlee. This information is from Katie Cleage’s Widow Pension file. I am 58 years of age, a practicing physician since 1853 and my post office address is Chattanooga, Tenn. I practiced my profession at Athens, Tenn., from 1852 to 1884. During my practice there from 1853 to 1865 I was the family physician to Alexander Cleage. 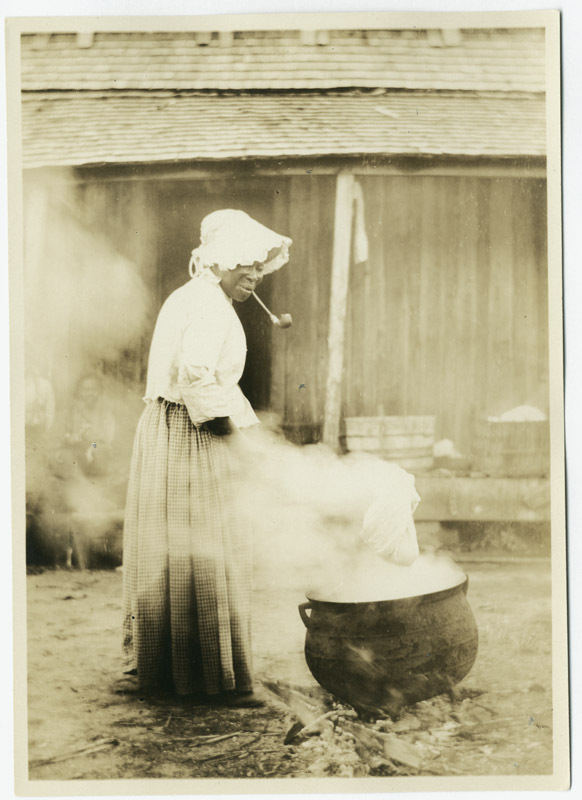 I recollect a colored household servant named Katie Cleage. I waited on her several times whilst she was a slave. I do not recollect what I attended her for. I do not know as to whether or not she was married or lived with any man as his wife. She was not married because they never married in those days. I do not recollect waiting on her in childbirth. I do not remember, but I don’t have any recollection of ever attending her for any venereal disease. I don’t think I did, I would be likely to remember if I did. I have no recollection of her ever being locked up and my attending her for any disorder. If she had been locked up, I would remember it. She may have given birth to children but I don’t remember. I recollect Philip Cleage. I do not know whether he had Katie for a wife or not. It was in the early part of the war when I remember the claimant as a young girl, I should say in the neighborhood of eighteen years old. I have no interest whatever in this claim for a pension. I always thought she was a right good darky. I never knew anything to the contrary. I have had no knowledge relating to her since the war. My answers have been correctly recorded. Q. Do you remember testifying before me the 16th day of last June, relating to the pension claim of Katie Cleage? Q. Have you any record of the death of your husband? A. Yes sir, it is recorded in my family bible. He died Feb’ 14th 1858. I sent my bible down from Athens to Chattanooga Tenn. to the marble Works to have a tomb stone fixed and I don’t know how they got it on the tombstone. My husband was born in Augusta Co. Va. March 30, 1806. The date in my Bible was made a few days after he died. There was only the one Nelson McCaury. Q. Are you a pensioner? Q. What was his name? Q. What is your certificate number? Q. Did Katie belong to Alex and Jemima Cleage when your husband married her to Philip? Q. Do you know how old she was when she was married? Q Was she a young girl, or grown up? Q. Was she married during the war, or before the war? Q. Who did your husband belong to? A. To Col. James Bradford. He is dead. His sons name is James. Q. How long has your daughter Minerva been married? Q. You still insist that your husband married Katie and Philip? A. Yes sir, because I was there. I was only at one wedding on the Cleage farm. Q. Were you ever at their cabin when Katie and Philip lived after they were married? A. Yes sir, I was there once. Q. Have you fully understood all the questions and have I set down your answers correctly? A. Yes sir, that is all correct just as I say I because I know it. Lucy McCaury lived with her daughter, Melinda Evans on D Street in Peabody Row, tenaments. 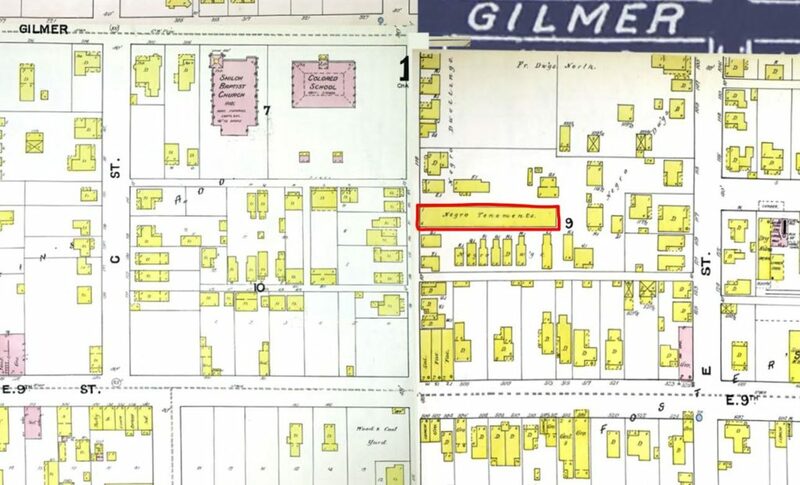 Here is a map and two articles sent to me by Sam Hall of ChattanoogaHistory.com after I asked for help in locating the street. 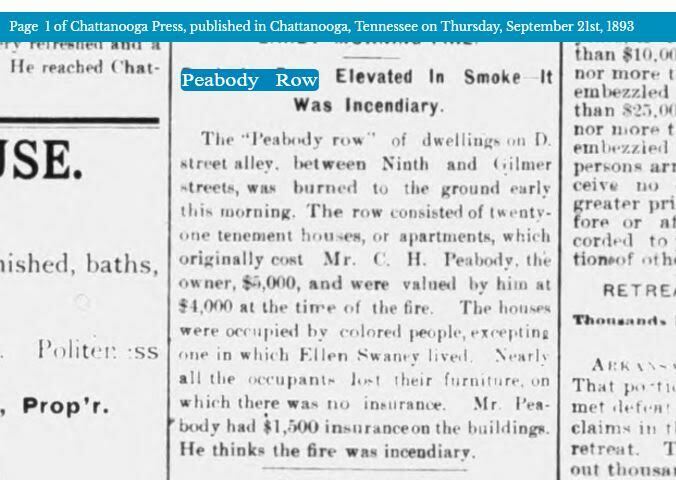 One of the best known colored residents of the Seventh ward is Tom Solomon, a miller by trade, who was one of the unfortunate persons who suffered by the fire a few nights ago in Peabody row. He lost all his kitchen utensils and clothes, and consequently since then his wife and two children have been in a condition of more or less suffering. “I found Daniels in his office, and told him Mr. Fritts had sent me to him to get some money. After stepping aside and consulting several minutes with Jordan Williams, another colored man in the room, Mr. Daniels asked me if I had my registration certificate with me. I replied that I did not but I immediately went home and returned in half an hour with it. Then I found Mr. Daniels in his office alone, and he asked me how much I wanted. My first idea was that he wanted to identify me by the certificate. I told him my circumstances and then he offered to loan me two dollars if I would leave my certificate with him. I asked him if he wasn’t willing to trust me for that amount, and he said he must have security, and said that on the day of election I could get the certificate by refunding the $2. Then I saw his object was to get possession of my registration certificate, and I indignantly left his office, taking the certificate with me. I still have it and will vote it on election day. Although I have suffered gret loss, and am forced to ask assistance of my friends for a few days, I will not sell my right to vote to anyone for any amount. Solomon volunteered this statement to the PRESS immediately after leaving Commissioner Daniels’ office Saturday, and said he was willing to swear to the correctness of every word. The public will not be surprised to learn the democrats have a fund for purchasing certificates, but some will be surprised that the headquarters of the purchasing act should be in Circuit Judge Moon’s law office. “The intention of the law” is evidently being vigorously carried out. I am 76 years of age, the widow of Alexander Cleage, and my post office address is No. 114 Sycamore St. Chattanooga, Tenn.
During the war and prior thereto I lived at Athens, Tenn. My husband Alexander Cleage died January 4th 1875. 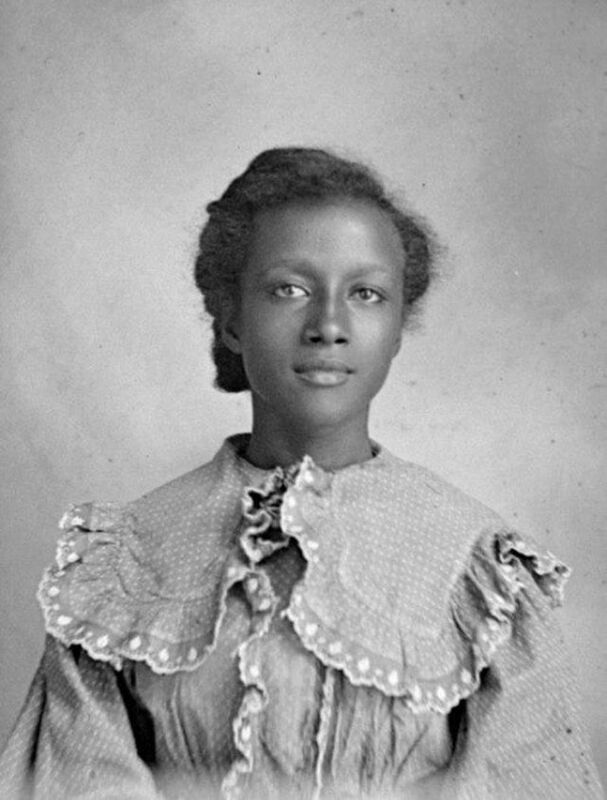 The claimant Katie Cleage was a slave and belonged to me and was a house servant. She left me sometime after the war began, after the army came here to Chattanooga (Sept. 1863). When she left me she came here to Chattanooga. I saw her once after she left us. That was a short time after the war. She came to Athens to see her friends. I do not know whether she was married at that time. It did not seem like she was married. She did not have any man with her. When she left us during the war she was grown, I do not know how old she was. She was about thirteen years old when we bought her. It was before the war commenced when we bought her. I don’t think we owned her not more than a year – when the war came up. She was a seamstress and I took her in the house. She did not sleep in the house. She had a brother around, Charles and she used to sleep out in his cabin. A girl named Sally and a girl named Jane done our cooking. We would change them back and forth. Malinda was the children’s nurse. Adeline was a nurse too sometimes. My daughter Mary married before Katie left us and I gave her Adeline. Mary married Alexander Brett, but I do not remember the name of the place in Mississippi where they now live, Mr. Brett is a railroad man and changes about. Mary married February 22, 1860. After Mary married, Adeline, now Adeline Sherman of Athens, Tenn. never lived with us. Adeline and Katie never slept in my house together. Adeline belonged to another family and slept at their house. Joe was the principal coachman but Philip Cleage used to take his place. Joe was quite an old man. He went back to Virginia and died there. Philips mother and father lived on the farm and Philip slept at their house. 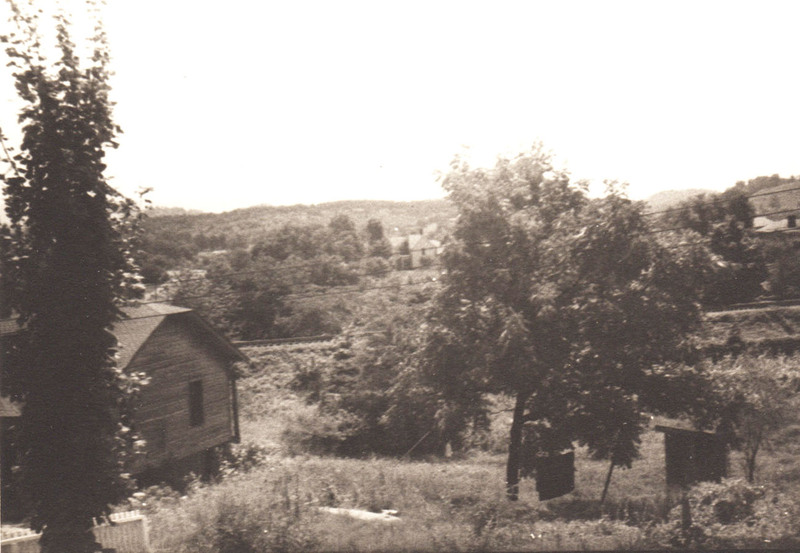 Philip’s mother died there on the farm after the war commenced. He might have lived with Sallie Cleage after that. I knew Nelson McKaury. He used to preach some. I don’t know when he did die. He was a great man amongst the darkies. I remember hearing them speak of him. I do not know as to whether or not Katie and Philip lived together as husband and wife. Having so many, I did not pay much attention and never changed my mind. I didn’t know just how many slaves we did have, but we had about one hundred. I have no record of births on the plantation. Yes, Katie had two children during the time she lived with us. Both children were stillborn. Both of the children were black, Katie is a mulatto and Philip was lighter than her. Dr. Atlee was our family physician. I think an old woman named Sallie waited on Katie when she was sick. Adeline Sherman was not living with us when the last child was born., I think she was when the first one was. No sir, Katie was never attended by Dr. Atlee for any other sickness. I always waited on the sick myself. Katie never had any other sickness that I know of. I don’t think Katie was ever confined in the quarters or for any punishment or any reason. She never was to my knowledge. I don’t remember whether there was any suggestion as to who was the father of her children. I can’t remember, I don’t remember anything about that. I had no recollection as to whether or not Philip was said to be the father. I have never heard that the coachman Joe was the father. I don’t know that Katie and Philip associated together. They did not eat inside the lot and they did not stay there, only when called on to wait on us. Oh yes, they might have been together and I not know it. If they had been given a room in the quarters to live together it looks like I would have known it, but then I might not. My husband never made a practice of marrying his slaves. He generally wanted to have something to say as to who they should marry. Katie’s moral habits were as good as the average slaves, she was not light naturally, but was good looking and passed herself off very well. We did not keep any record of the marriages of our slaves. I do not know of any man with whom Katie did live, she never lived with none that I know of. I have no interest in this claim for a pension. Katie was a truthful girl. My son John was a boy 14 years old and was at home during the war. My Thomas was away all through the war and for two or three years after. He was cashier of a bank and was ordered to take the bank south and did so. His wife, Mrs. T.A. Cleage Sr. was sent south to him and was not at Athens. I have fully understood all your questions and you have set down my answers correctly. Q. Did you know of this old man Nelson McKaury going around and marrying the slaves? A. He used to marry them. I don’t know that he married Katie, I know he used to go around and marry them. Q. Katie says that you furnished her and Philip with blankets and a room. Do you remember anything about that? A. Whenever any of our slaves wanted blankets, or needed anything they came to me and I furnished them and I would not remember whether I furnished Katie and Philip or not. I found the information used in this post on ancestry.com, Katie Cleage’s Pension file. Plantation house with causeway between house and kitchen. 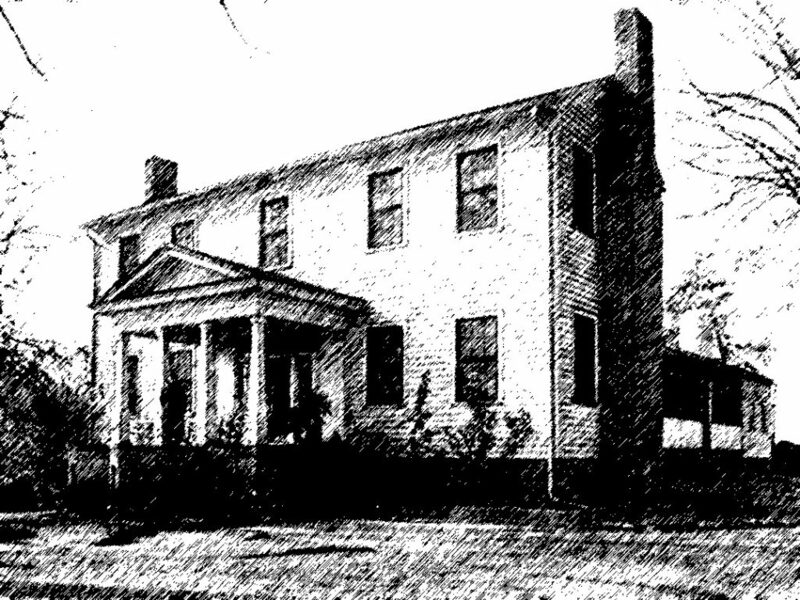 I imagine the Alexander Cleage plantation house looked like this before the fancy columns were added. I have heard read all the testimony that has been taken in my case. I want to say that Lucy McCaury is certainly mistaken. Her husband did not marry me to Philip. I do not remember Nelson McCaury at all. I remember Lucy tolerably well, she had one girl named Minerva. I have not seen Lucy McCaury but once and that was at the church directly after the war. Relating to the charge that I was locked up in the quarters with a disease, it is not true. I never was locked up and my old mistress does not give any such recommendation. Dr. Atlee did doctor me for a miscarriage but that was Philip’s. Both of the children I had were by Philip. Old Uncle Joe was a very old man and I was nothing but a young girl and he never had anything to do with me in his life. Between the smoke house and the kitchen part there was a large shelf where we kept our bed clothes and Ad Shurman would go for them one night and I would go the next and it was when I went out after clothes at night that Philip and I got together. Old master said I was getting fat before I knew what was the matter and he whipped me terribly. There was a fellow around, David Johnakin coming to see me and master said I could not have any one but one of the home boys and I did not want one of them because I loved David, but master called me one day and told me he was going to make me and Philip marry. It was on a Sunday and a very warm day and master was laying at the far end of the porch and he got up and went and got some book and read something to us. I was very young and did not know and never did know what it was and then he told Philip he could just consider himself one of the married boys on the place. I disremember it has been so long, whether mistress was home or how it was. I just remember how old master made Philip and me have one another. When we were refugeed off during the war Philip and I were together all the time and after they brought us back home, I had my other child. It did not live but a very short time after it was born. That is the child that David Bridges knows about. I never gave birth to a white child. I am light colored and Philip was three shades lighter than I am and he had almost straight hair. Liddy was the cook in the big house and Ad Sherman and I had to carry water and I told Liddy I was sick and she told mistress, that was one Sunday evening later. Sallie never was in the room and never had anything to do with it. I never was locked up out in the quarters and I never had any disease in my life. Julia Ann Evans was (crossed out) Hulda Hurst was my mother and she lived at the time some five or six mile from our place and any time I went to see her, Philip always went with me. I have no further testimony that I desire to have taken. I found David Jonakin living in Athens. He married and had a family and I will be writing more about him later. Athens, TN in the 1920s. Family photo. I do not know how old I am, I can’t tell pretty near. Yes, I was grown up at the time of the war. I am a laboring woman and my post office address is Athens, Tenn. I was formerly a house servant for Mrs. Jemima Cleage and lived at the Cleage house on the farm. Katie Cleage and Lydia Cleage were house servants. Katie was a seamstress. I did not leave the Cleage family until after the war. Katie left there just before the soldiers went to Chattanooga she slipped off at night and went to Chattanooga. Katie was not married when she lived on the Cleage farm and before she went to Chattanooga. She did not live with any man as his wife. Me and her slept in the house together all the time. Yes sir she had two children. She slipped out at night is the way she came to have these children. Old Uncle Joe Cleage was the father of one. The other child was a white child. I could not tell who was the father. I know Uncle Joe was the father of one because he was slipping around there and I see them together several times. Old Uncle Tom Louis claimed the white baby. No he did not tell us, the woman that was with her told that it was white. Aunt Juda Cleage was the woman, but she is dead. I never saw either of the children. They were born dead. No sir, Katie did not go with anyone else besides Uncle Joe. He is not living. Yes she did sleep in the quarters back of the house. The white folks put her there. She had the disease and they did not want her in the house. They put her off in a room by herself and carried her provisions to her. I don’t know how she staid there, she staid until she got well. Oh it was nearly a month that she staid in there. She had a doctor. Dr. Atlee told what was the matter with her and he never came back no more. I didn’t know whether no more doctor came or not, they never would let us go where she was. Because she had that disease and they was afraid we would take it. I am sure it was on account of her being diseased. That is the only time she staid in the quarters away from us, only when she was sick and had her babies. Philip Cleage belonged to our white folks then and worked out in the field. No sir, Katie never lived with Philip as his wife. I did not see Philip after he went in the army. She was not with him while they were up the road, up at Knoxville. She went to Chattanooga just before the soldiers. I do not know whether she staid with him in Chattanooga or not. I have not seen her but once since the war. I have not talked with anybody about this matter. Yes sir, I talked with Uncle Charles today about it. He said you wanted to see us. He did not say anything about the case. I never knew Preacher McCaury. I did not know Lucy McCaury before the war. I did not know Minerva McCaury before the war. I knew that Philip and Katie did not go together before the war. I am not related. I have no interest, not a bit in this claim for a pension. I have fully understood all your questions and my answers have been correctly recorded. Adeline Cleage Sherman was Sallie Cleage Marsh’s first husband’s child by his first wife, Jane Cleage. That is, she was Sallie’s step-daughter. Until Jane’s death sometime after 1900, she lived next door to Edmund and Adeline Sherman. Jane is mentioned in Alexander Cleages Will, written in 1860, as Adeline’s mother. Edmund Sherman served in the same Company as Philip Cleage. The Uncle Charles who she mentions, is Charles A. Cleage, Philip’s brother who testified earlier and who was one of the siblings who got Philips arrears pay.